The fascination for the big, long word, more for the word itself than for what it means or suggests—this is almost a sensual fascination. ‘Almost’ because we shy away from such a thing as word—fascination. And words don’t die. Memories of places, those we loved and are no more, fade away for ever, but words walk out of the cold storage, as it were, and surprise us like forgotten acquaintances. They sometimes come to stay. Per-so-na-li-ty...how did Ram Bahadur negotiate the tentative beginning, the soft and stable rise, the silken yet steady fall of the five-syllable word? The poor weaver might have winced as the father drooled. Despite his some English, Ram Bahadur couldn’t catch the sense of the time. It was time to dare more and drool less. It was time to cut down on words, on personalities. Shiva won’t wait for the cloud caused by Veer’s illness to disperse. From books of history he had learnt that the contradictions can’t be wished away. The conclusion is never reached; one only moved towards it, uncertainly yet doggedly. Moreover, Shiva was always short of patience. He’d start a thing and then wonder what to do next. So he brushed aside father’s advice to wait and had the old building—except for the older northern portion—razed to the ground. The entire family was made to seek shelter in the sensibly unrazed portion which comprised one very large room (here trunks served for beds) and dung-smelling shed, where the cows (they were never more than two in number) were hustled into in rains and cold. During the two month long summer vacations, Shiva read and mused over Shakespeare and Milton in this dungish but cool corner. Nothing exhilarates more than the sight of a habitation coming up. It has the touch of a new civilization taking shape. It didn’t matter if the architect was called from a big city or the village mason made the design or it emerged from the stubborn resolve of Shiva or from the unarticulated blessing of his parents. What mattered was that it was coming up. Shiva had started with a shaky fund and on assurance from Iqbal that he’d not let shortage of material stand in the way. Iqbal became the backbone, and it was later found that his advice should have been better avoided. Why were the bricks which were extricated from the rubble of the razed portion used in the foundation of the new house? Ram Bahadur’s sullen silence was not warranted. Didn’t he see that Shiva had neither time nor experience to take care of the sundry details? Shiva’s mother fumed and fretted but couldn’t succeed in breaking the strong indifference of her husband. Perhaps the discomfiture he suffered over Rukmini’s marriage had weakened the parental chord for ever. Ram Bahadur’s unnatural indifference was, however, swept away by the rising current of jealousy, intra-caste rivalries, deliberate villainy and much more, which constituted the essential diet of life in the village called Satnampur. Shiva was still a stranger to the unimaginably endless drama behind the still life of the village which was, by any means, large and ever expanding in terms of population. There was not much wealth, and almost no striving after it, hardly a thing called aspiration could be spotted, but its very size, its proximity to the district town & therefore to the law courts, besides a sizeable Muslim population which was in terms of consciousness more vibrant—all these and more made Satnampur in the early 1950s a spark waiting to ignite. Shiva knew about the topography and demography of his village but as remotely as he knew the places on the maps of India and England. So when Iqbal was heckled by a group of youths for absolutely no provocation from the former, Shiva was more than surprised. He was still in his early twenties and he had travelled remarkably far in life because of hard work and, of course, a modicum of opportunity. He didn’t ever think that he had grown into a sort of nucleus around him unfamiliar sensations would arise and clash for prominence. Iqbal was hated because he had occupied the whole space where Shiva stood and moved in the stupefied imagination of the people in the village. It was more than a pressure on the emotion; the equation of power in the village looked like shifting from the southern tip to the western, where the new house was coming up. You live in relation to others, howsoever aloof, secluded, taciturn you may be. They will catch you by the scruff of your neck. They will catch you and bring you to the ground, maim you for life if you don’t acknowledge their presence and their limitless tine for surveillance. Shiva’s intelligence, his insight were put on test by the assault on Iqbal which the latter had, smartly, shrugged off. Shiva could see that the incident might trigger off a Hindu-Muslim row, besides the scare of the police raid on the village upset his nerves. Finding himself so close to the cause of the possible flare-up, Shiva rushed to his father. That broke Ram Bahadur’s indifference. That was fascinating. Good writing. Was the novel completed, even in its first draft? Thanks for your mail. I have feeling that the novel can be brought out, though am yet to figure out the ending, which I think I will be able to. Read the message alongwith the extract.I had no idea that he was working on a novel,too.You seem to have done a very noble job.My respectful tribute! 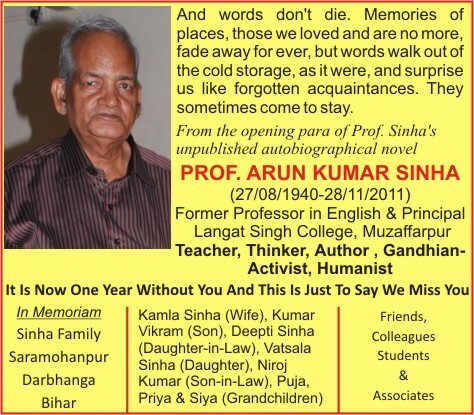 Your untiring effort to get your beloved father's autobiography posthumously is the most appropriate homage one can pay to the departed soul! Further,your long,enduring and fruitful period from Shalimar Bagh to the pinnacle of present stature was always blessed with your father's vision. You have always been mentoring to us by way of adopting realistic ways devoid of rat-race towards culture of consumerism. I pray to the Almighty God to enable you to succeed in your noble cause and bestow light and happiness in a meaningful way to the needy.